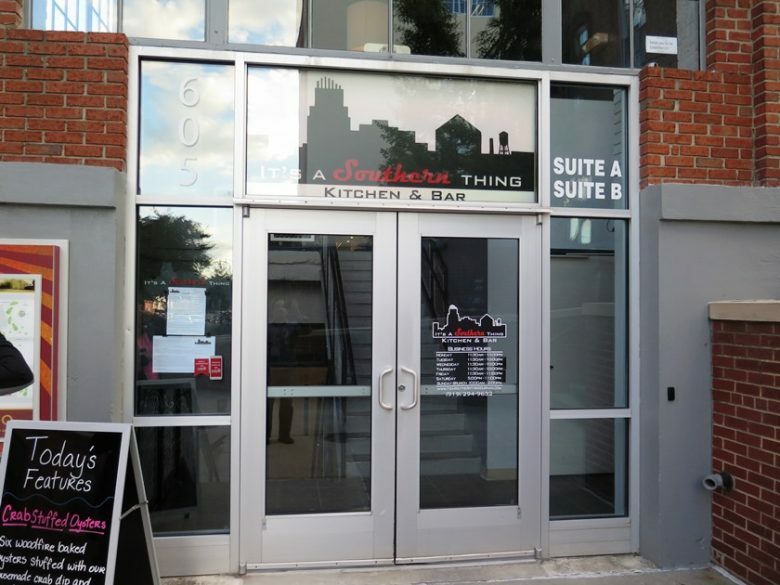 First, if you haven’t been to this space before, it sits conveniently on Main Street between the downtown Durham core and Brightleaf Square. Which means you can do it for a visit to DPAC if you’re willing to walk a bit (leave the high heels at home). Street parking is a bit limited in this area so be aware! From the outside, It’s a Southern Thing is not that noticeable outside of a large brick wall with paned windows overhead. Find the side entrance and hop upstairs to the warm, cozy dining room. Inside, the space hasn’t changed that much since its days as Motto. You’ll still find the same bulb-lit “BAR” sign overhead but they’ve gone with a more casual interior. No more fancy fabric lamps, in with the barn-door plank tables and a more open and better lit space. With a view into the open kitchen it all feels like you can pop in here for a quick meal rather than a more formal dinner. And the prices here at It’s a Southern Thing reflect that: appetizers and salads are in the $8 to $12 range while entrees run from $14 to $22, pretty good for Durham! 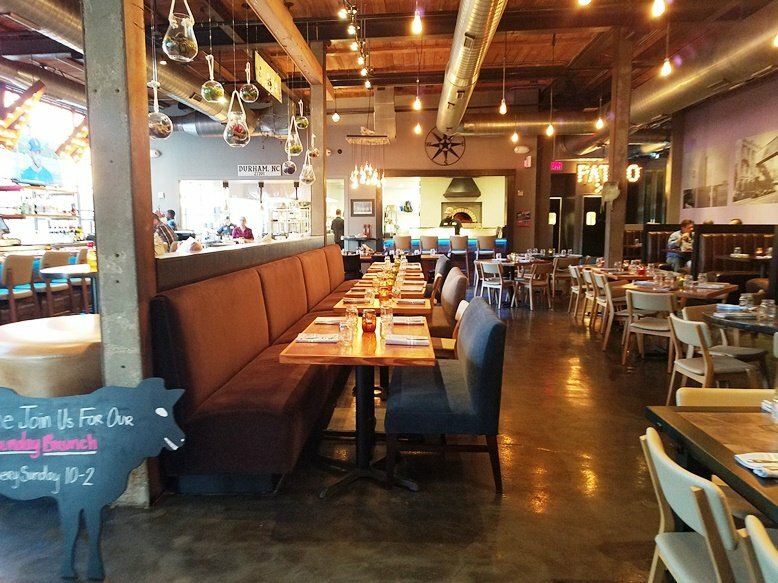 I’ve had the chance to dine at It’s a Southern Thing for a couple of meals, one a comped media visit and another out of pocket to get a good feel for what they’re doing. 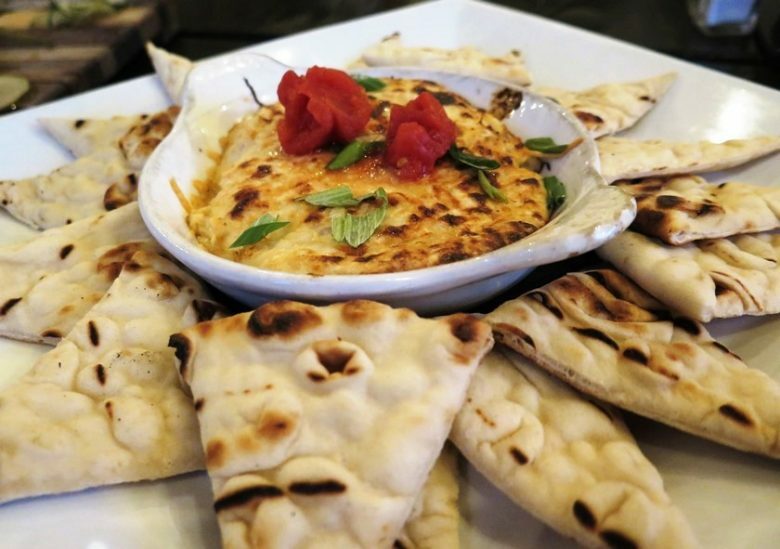 The crab dip with pita points is a great starter! Bubbly, cheesy and with plenty of crab inside for flavor, it’s a generous portion and best shared amongst 2 – 4 people. 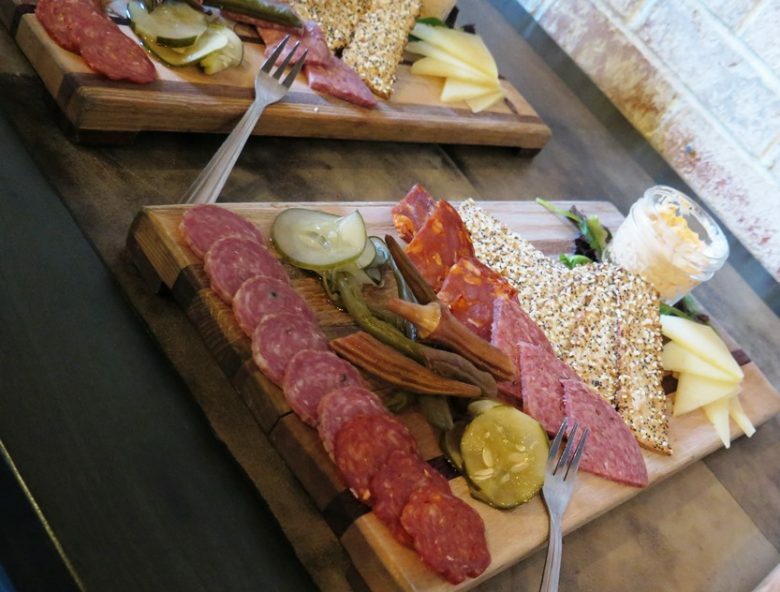 And the charcuterie plate offers a great selection of cured meats, pimento cheese along with these wonderful seeded crackers! 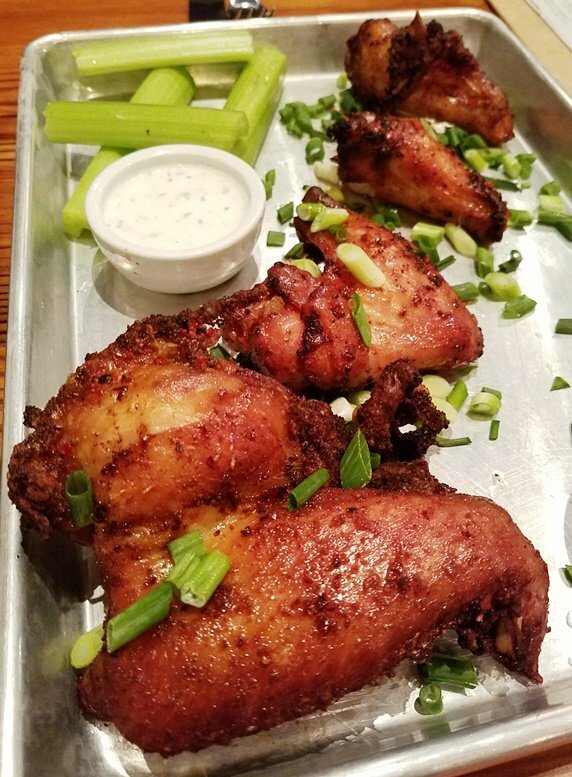 Moving on to the meat and mains, It’s a Southern Thing’s smoked chicken wings are simple but very tasty. 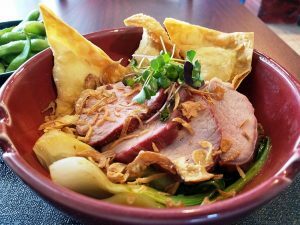 Tender with a nicely browned skin, there’s a lot of deliciousness here in this simple preparation. And a big thumbs up for their meatloaf! It’s actually “Pete-loaf” and named after the owner. Instead of a mix of ground beef and pork, they’ve updated the meatloaf with ground bacon instead! So while you get two smaller medallions of meatloaf, it’s super-rich and flavor-packed. Served over roast fingerling potatoes, it’s a great example of the type of comfort food you’ll be served at It’s a Southern Thing and gets a big thumbs-up from me. And of course you couldn’t do a Southern restaurant without the ubiquitous shrimp and grits plate! 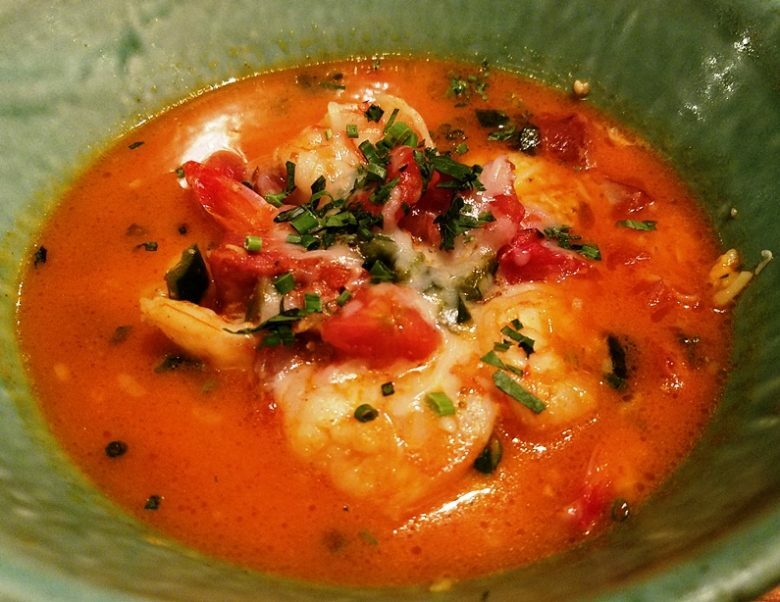 It’s a Southern Thing amps up the flavor of their shrimp and grits with some andouille sausage, tomatoes and chiles, an interesting combination! 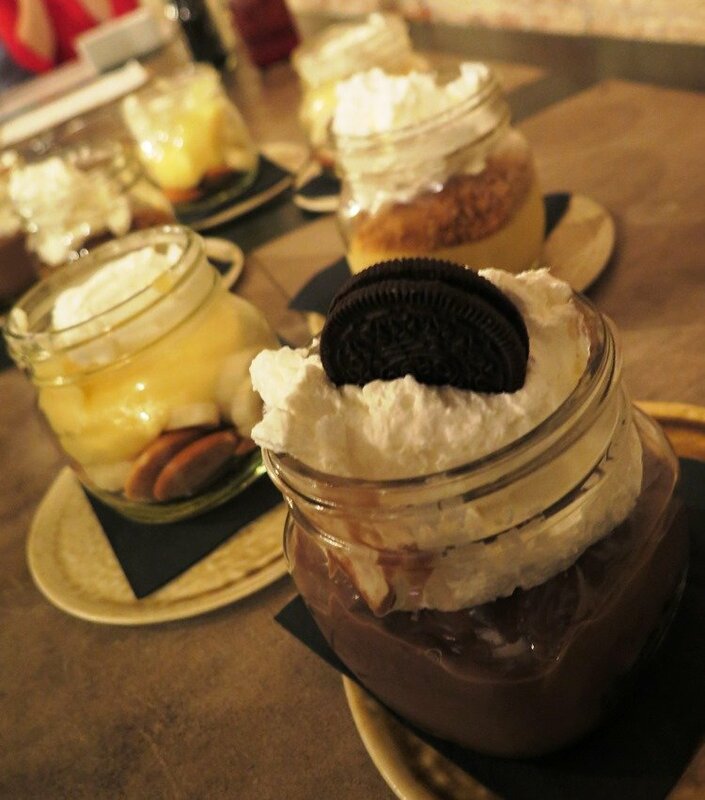 We also tried their desserts in a mason jars, banana pudding, chocolate mousse and more to finish off your meal in style. Service for both my visits was attentive and pleasant. While the staff is dressed down pretty casually here, they are very service-oriented and well-trained. 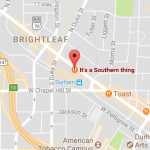 Overall I think you’ll find It’s a Southern Thing to be a pleasant and tasty dining option in downtown Durham. 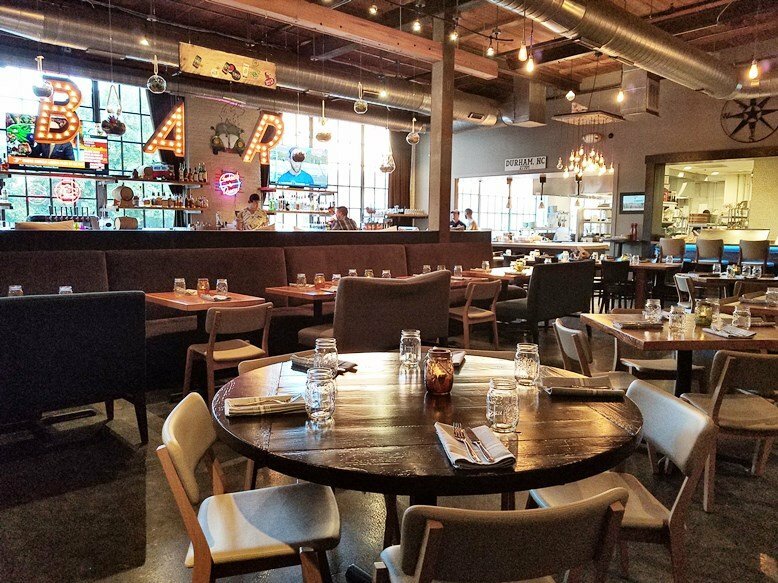 The food is good, the space is beautiful and it’s all paired with solid service. 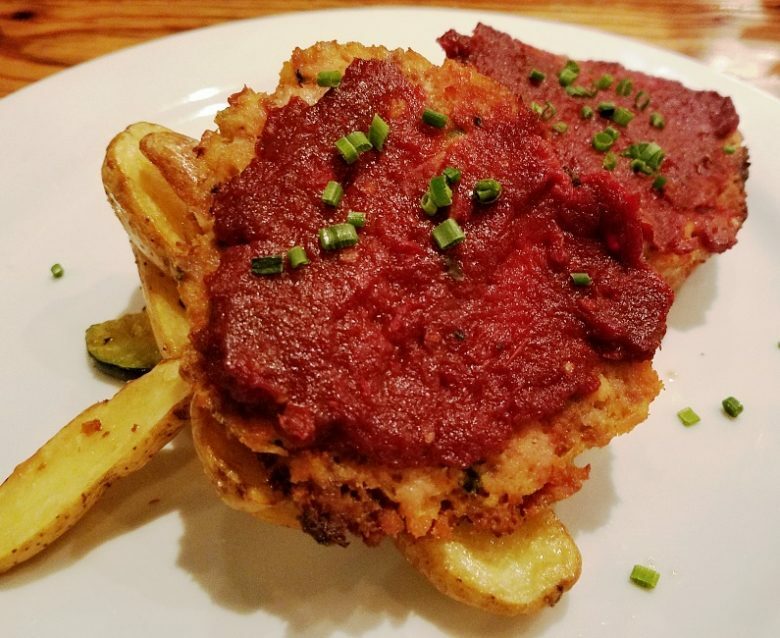 At the price points they have their menu, It’s a Southern Thing is offering up an excellent option for the lunch and dinner crowd in Bull City. So give em a chance if you’re in there area! 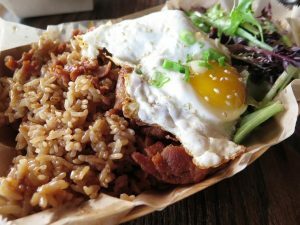 Along with Maverick’s Smokehouse, Saint James Seafood and Grub, you’ve now got some interesting new dining options on (and off of) W. Main Street in Durham!